Ehlimana Alibegovic-Goro and Matea Grabovac, both national UN Volunteers, have been serving with UN Environment (UNEP) in Bosnia and Herzegovina* since February 2015 on a variety of projects: from implementation of a environmental information system and air quality improvement to protection of the country’s natural habitats. They decided to become UN Volunteers to contribute to UNEP’s mission of preserving the unique natural beauty of Bosnia and Herzegovina. 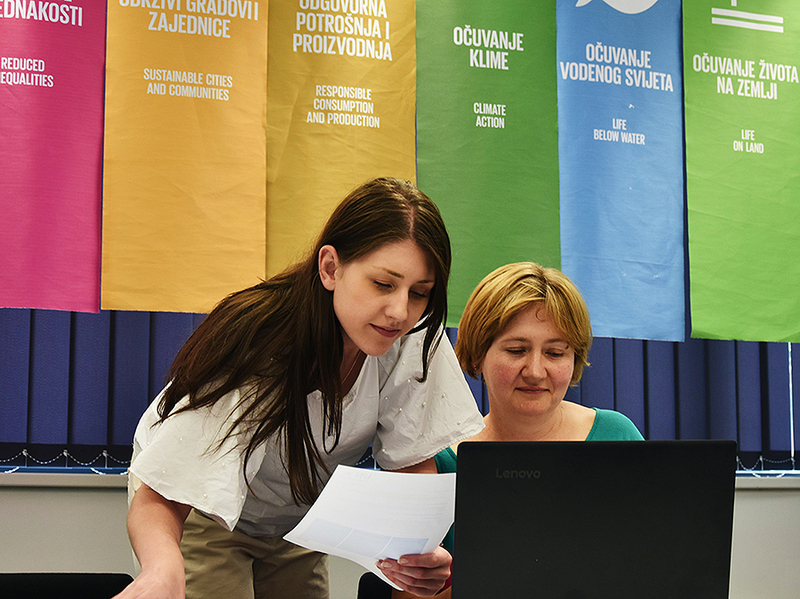 Matea Grabovac and Ehlimana Alibegovic-Goro (right) serve with UN Environment in Bosnia and Herzegovina; here they are at work at UN House in Sarajevo. Bosnia and Herzegovina, a country that is among the richest in biological diversity in Europe, prides itself in being home to dozens of endemic species of flora and fauna. However, due to socio-economic pressures and a low level of public awareness, this richness of life if often not recognized nor protected properly. To address this challenge, Ehlimana and Matea are currently working on the project Achieving Biodiversity Conservation through Creation, Effective Management and Spatial Designation of Protected Areas and Capacity Building, funded by the Global Environment Facility and implemented by UNEP. It aims to support expansion of national protected areas system from the existing 2.4 per cent to at least 5 per cent, thus doubling the protected area territory of Bosnia and Herzegovina. This project was initiated in response to achieving Goal 15 of the Sustainable Development Goals (SDGs), devoted to ensuring sustainable use and conservation of biodiversity. For example, one of the areas that UNEP in Bosnia and Herzegovina is trying to include into Bosnia and Herzegovina’s Protected Area Network is Livanjsko field or Livanjsko polje, which is the largest polje (karstic field) in the world. Circled by tall peaks and mountain ranges, the Field is characterized by many unique natural phenomena and karstic features that need to be preserved. An essential part of Ehlimana and Matea’s work is ensuring public awareness of the project and advocating for protection of natural habitats of Bosnia and Herzegovina. Under UNEP’s guidance, UN Volunteers are working together with a wide range of stakeholders, government institutions and local communities to conserve the unique natural beauty of the country and safeguard the wellbeing of its communities. "Ehlimana and Matea work tirelessly to travel to distant villages and speak with local people about the importance of nature conservation and establish contacts with media representatives and other stakeholders to raise awareness about the importance of protecting natural values of Bosnia and Herzegovina," says Amina Omicevic, UNEP National Officer and supervisor of Matea and Ehlimana. Ehlimana and Matea have already conducted numerous meetings, workshops and consultations with local communities and governments of Bosnia and Herzegovina at all levels, and are not planning to stop until all concerned are on board for implementation of this project. With their acquired experience and determination to succeed, these UN Volunteers strongly believe that UNEP will achieve the project's objective and expand Bosnia and Herzegovina's protected areas while preserving the unique and beautiful nature of their country. *UN Environment in Bosnia and Herzegovina is a key government partner in a number of environment-related processes, including the design and execution of the national Global Environment Facility portfolio. Since 2010, the UNEP office has delivered a total of US $4.3 million to Bosnia and Herzegovina through a portfolio of projects such as achieving biodiversity conservation, improving air quality, support to environmental data collection and reporting and the MEA implementation and other cross-cutting issues.